Colin Kaepernick likely had no idea, the first time he took a knee, about the cultural war he was about to unleash on our society. Whatever his initial motivation, the end results have been explosive and long-lasting. Just when it seemed that things had died down into an uneasy semi-tolerance, Nike blew things wide open when they unveiled the Kaepernick as the face and voice of the 30th anniversary of their “Just Do It” campaign. Once again, celebrating someone who dares use the national anthem and a vehicle as wide-reaching as the National Football League to protest police violence and racial inequality is the center of social media arguments and protests, with one side vowing to burn every Nike product they own while others ridicule them for doing so. The discouraging part of it all for those who defend Kaepernick’s right to use peaceful protest in any form to protest social injustice is the fact that this issue has once again swung the far-reaching fingers of capitalism into the fray. Every post of someone defending the campaign brings attention to Nike. At the same time, every post of someone setting their sneakers on fire and declaring they will never buy from the company again seals the Nike swoosh symbol in every consumer mind. On the face of it, this is a good thing when the controversy also stirs a reminder of Kaepernick’s original message and protest back to the forefront. Those who back the protest, however, must work to ensure that the capitalist side works for the good of the fight rather than overtaking it. The fact that the Nike campaign does not include anything in the ad about police violence or systemic racism or any of the issues that energized Kaepernick’s actions in the first place is worrisome. 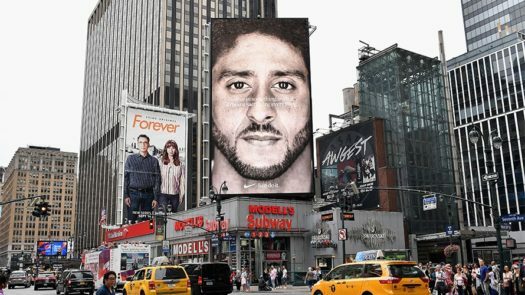 Is Nike willing to appeal to a younger market far more likely to see athletes like Kaepernick as a hero rather than a villain at the cost of alienating their older consumer base for a profit, or because they agree with a message? Let’s face it. Nike has not gone out of their way to align themselves with human rights, accused of poor labor practices in China and Southeast Asia and a work environment that has been accused of being sexist. Is the Kaepernick campaign the start of a idealistic turnaround? Let’s hope so, because the truth is, showcasing Kaepernick and furthering his message was a brave move, the right move, one that will hopefully help have a lasting impact. Because the truth is, the message Kaepernick brings needs to continue to resonate. As the ad suggests, he has genuinely sacrificed a great deal in the name of principle. Kaepernick’s message about protesting racial injustice has become more relevant since its origins at the height of the Black Lives Matter movement. We have a president who stirs white supremacists and emboldens those who exploit racial division. In so many ways, racial equality has taken a step backwards since Trump took office, and Nike’s campaign is bringing it back to the forefront. Let’s just hope it’s for all the right reasons, because this is a partnership that could be the beginning of a new path for a message that needs to be heard.